by Robert Henrikson Available at Amazon.com. The Complete Guide To A Powerful Food That Can Help Rebuild Our Health and Restore Our Environment. Since 1989, Earth Food Spirulina has been called the definitive popular reference book about spirulina. 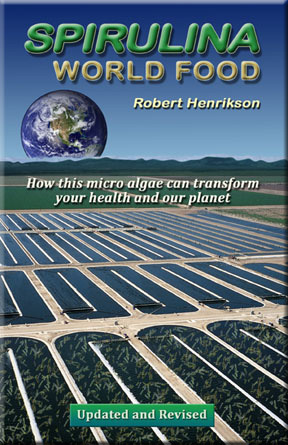 This 2010 edition Spirulina • World Food has been updated by the author, Robert Henrikson. He has pioneered algae as a world resource for 30 years, and was the President of the leading algae company and a director of the world’s largest spirulina farm. • Super health programs using this green superfood. • New scientific discoveries revealing medical benefits. 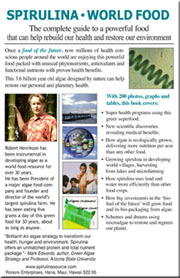 • How algae is ecologically grown, delivering more nutrition per acre than any other food. • How spirulina uses land and water more efficiently than other food crops. • How big investments in the ‘biofuel of the future’ will grow food and its bio-packaging from algae. • Schemes and dreams using microalgae to regreen our planet. FREE. Download this entire book as a 194 page pdf file (4.5 MB). Earth Food Spirulina and Spirulina World Food International Editions. Author Biography for Robert Henrikson as a Spirulina Bioneer covering the period 1977-1999. Book Reviews for Earth Food Spirulina.